Dyna-Ski Boats: Adaptive Speed Control and Inboard or Outboard boat motor? Adaptive Speed Control and Inboard or Outboard boat motor? I was reading a magazine called Boating Industry. In an article called "Launch" about new engines a portion of it focused on Mercury's new purpose-built marine engine a 4.5L V-6 250 horsepower sterndrive. The article also included the Evinrude G2 and new Suzuki outboard motors. The two parts I found very interesting was the statement made by David Foulkes vice president of product development at Mercury. 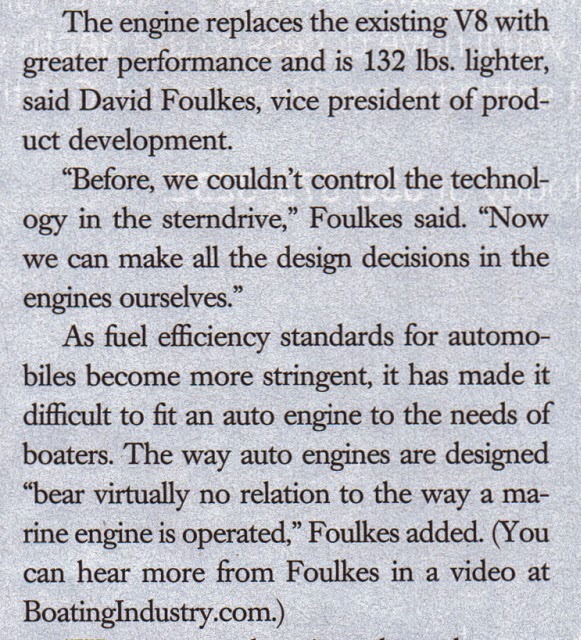 He says about automobile engines in boats "it has made it difficult to fit an auto engine to the needs of boaters. The way auto engines are designed bear virtually no relation to the way a marine engine is operated". A thought I have shared for many years. So it seems that outboard engines were the only engines designed for use in boats up until Mercury's new purpose-built marine engine the 4.5L V-6 250 horsepower sterndrive. The second and more interesting perhaps statement was that the motor has what they call "Adaptive Speed Control (ASC) which automatically maintains the set RPM point regardless of load or condition changes, such as tight turns, tow sports and lower speeds on plane. This is a big step in the right direction for water skiing. Now if only Evinrude would apply it to their line of engines and Mercury would expand it to include their OptiMax engines as it is only an option on the Verado line.